Commissioners President Blaine Young said “his” hearings would be done in one night. How about three nights down and we’re not done yet! We go back to work at 6:00pm on Wednesday April 23rd at Winchester Hall. The evening begins with RALE’s lawyer Michele Rosenfeld conducting her cross-examination of the developer team. Afterwards, it’s your turn. 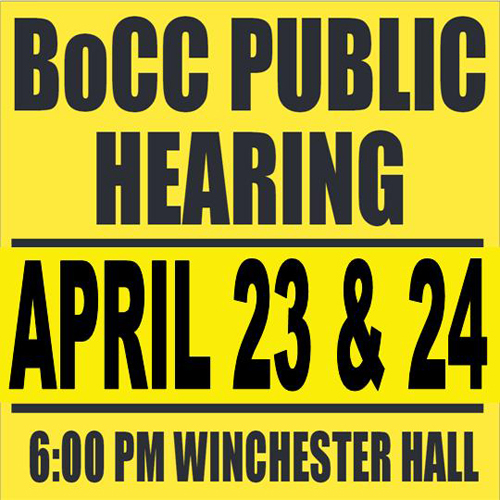 Now is the time for public testimony about the Development Rights and Responsibilities Agreement (DRRA) and the Adequate Public Facilities Ordinance Letter of Understanding (APFO LOU). More than 80 people signed up to speak on these issues. If everyone shows up, the hearings will probably go to Day 5 on the 24th! 1. 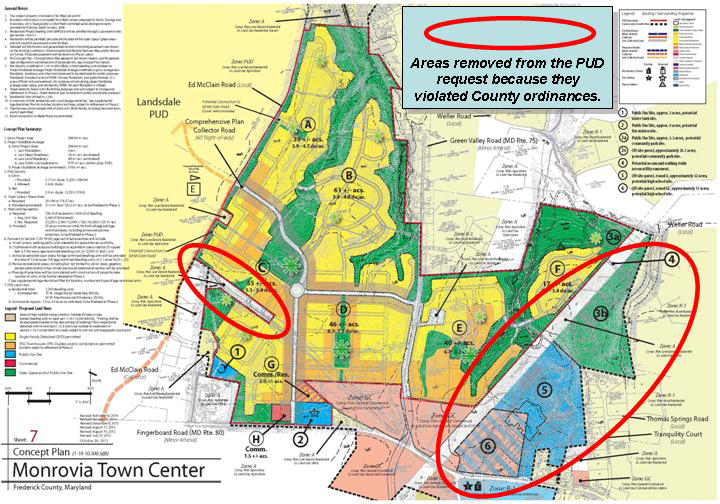 Do you really think that this development is consistent with the Comprehensive Plan. Hint – it is not. 2. Do you think the 18-year duration of the contract that, will bind 4-5 future County governments, is good public policy? 3. Do you believe that the County has a plan to mitigate the impact on our schools? 4. Do you believe that the County has a plan deal with the safety and traffic issues on Route 75? I know we’ve talked about these issues in prior hearings, but it is STILL a problem, and it is very relevant to this portion of the hearing. 5. 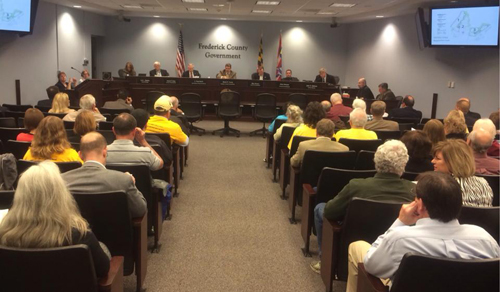 Do you think that their traffic study was effective considering that it ignored Weller and Ed McLain Roads, and the traffic counts at intersections like Route 75 and MD 355 seem too low. 6. What do you think about the fact that there will be a 4-lane highway separating seniors on the east side from the commercial portion, and the students on the west side from the high school. Does that sound like a “walkable community” to you? 7.Does anyone really think that the “age-restricted” community will stay age-restricted? 8. Would you send your children to a high school located right under high tension power lines? Is that proffered high school site worth anything? 9. Have you read the LOU and noticed how easy it will be for the developer to buy their way out of many major road projects? Who will do the work after the developer writes a check? When will the work be done? There are no answers to these questions in either the DRRA or the LOU. Is anyone feeling very trusting in the County to do these jobs? 10. Did you know that this 18 year contract is dependent on two memoranda that haven’t been written (Water Tank and High School Site), and involve parties that aren’t part of the contract? Does this sound like good business sense? That’s just a few things – I know you’ll each bring your own valuable perspective. When all the testimony is over, the developer will have 5 minutes for their rebuttal. If this goes like the zoning portion of the hearing, we can then expect the Commissioners to spend the next half hour lobbing softball questions and falling over themselves praising the developer team. Not exactly neutral are they? I know, I know – we’ve always know they aren’t. The Commissioners will deliberate over zoning and DRRA/LOU issues and then they’ll make their decisions. In all likelihood they’ll approve and that will officially begin the next phase of our efforts. One last thought. 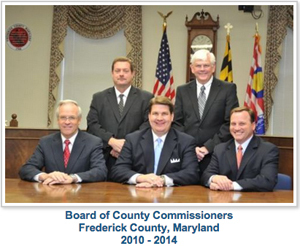 Each and every one of those Commissioners are seeking further elected office. Commissioners Young and Gray will face off against each other for the Republican nomination for the County Executive seat. Paul Young wants to be a State Delegate. Kirby Delauter is seeking a Council seat for District 5, and Billy Shreve is seeking an At-Large Council seat. Four out of those five do not want to still be discussing this issue. They would much prefer this to have been completed months ago. Development is a big issue in this campaign, and they are on the wrong side of the issue. Let’s be sure and remind them of that. Let’s be sure to tell them that come election time, you won’t forget how they voted. Tell them you won’t forget how they traded your health, safety, and welfare away to line the pockets of a few developers.